Ryan and I have been shifting our eating habits lately to focus on more sustainable eating while also fueling our running and hiking (and the big appetites that come with them). We both now follow a sort of “vegetarian-before-6” way of eating. It’s by no means a strict rule because both of us despise restrictions. There’s usually at least one day on the weekends where we eat more meat, but that’s balanced out by at least one day per week where we eat completely meatless. Lunches are a tricky meal in general to plan, so I often go through phases of having a staple meal for my lunch. No thought, which means no decision fatigue or wasted energy over what to eat. As you can probably tell from the lentil recipes I’ve shared recently, lentils have become my go-to options for a satisfying vegetarian meal that will help me recover from my morning runs and fuel my afternoon strength or Pilates workouts. This lunch is so embarrassing simple, but those are the type of recipes many of us need, aren’t they? When you’re balancing family, training for a race, and a full time job, you don’t want to spend hours each night slaving over the stove to cook dinner and prep lunches. At the same time, however, you don’t want to sacrifice nutrition and fueling your body. This recipe has become my go-to lunch for multiple reasons: ease of preparation, nutrition, satiety, and, most of all, taste. 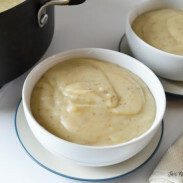 And, this simple meal is dairy-free, gluten-free, and vegan! Who said that nutritious, simple eating had to be boring or difficult? It’s an easy meal that I can prep ahead of time by cooking a large batch of lentils at the start of the week. Since I work from home, I roast the sweet potatoes each day, but you can easily prepare these in advance as well. Even if you make everything from scratch, this meal will only take 45 minutes to cook – with only about 5 minutes of hands-on cooking time since your oven and stove will do most of the work. While I am not a nutritionist or registered dietician, I know that potassium offers numerous nutritional benefits for endurance athletes. Potassium is one of the four primary electrolytes, which means you lose it through your sweat during intense exercise. Low potassium levels can cause muscle fatigue, cramping, fluid and electrolyte imbalance, and diminished athletic performance (source). Thankfully, potassium is easy to get a wide array of foods, especially if you eat a diet rich in fruits and vegetables. Along with bananas (which is why they’re a great pre-run snack), sweet potatoes and avocados are abundant in performance-boosting potassium. And let’s not forget satiety and taste. Runger is one of the worst parts of training for a marathon or half marathon, because it’s frustrating to be hungry, hungry, hungry all the time no matter how much you eat. Thanks to the slow-burning complex carbs (and plenty of them, since runners need carbohydrates), healthy fats, and sheer volume of this meal, you’ll be full for hours. And flavor? 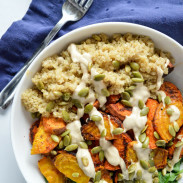 Smoked paprika plays to the sweet-savory note of the sweet potatoes while adding a kick of spice that will jolt you and your taste buds out of any mid-day slump. If there’s one spice I’m obsessed with right now, it’s smoked paprika. Chicken, lentils, sweet potatoes, fish, roasted vegetables, if it’s savory, it will taste even better with smoked paprika. You can follow the recipe below to cook the lentils, or you can make a spicier dish by following this curried lentil recipe. The curry flavors taste amazing with the spicy sweet potatoes! 1. Preheat your oven to 425 degrees Fahrenheit. 2. Chop the sweet potatoes into small, equal sized pieces, and toss with the olive oil, smoked paprika, garlic, and salt. Line a roasting sheet with parchment paper and bake for 40 minutes, stirring partway through for even cooking. 3. With 20 minutes to go on the sweet potatoes, chop the zucchini and add in with the sweet potatoes to cook for the remaining 20 minutes. 4. Combine the lentils and water/stock in a pot and bring to boil over high heat on the stove. Reduce to a simmer and let cook for 10-12 minutes, until water is absorbed. Stir occasionally as needed. Season with salt to taste. 5. 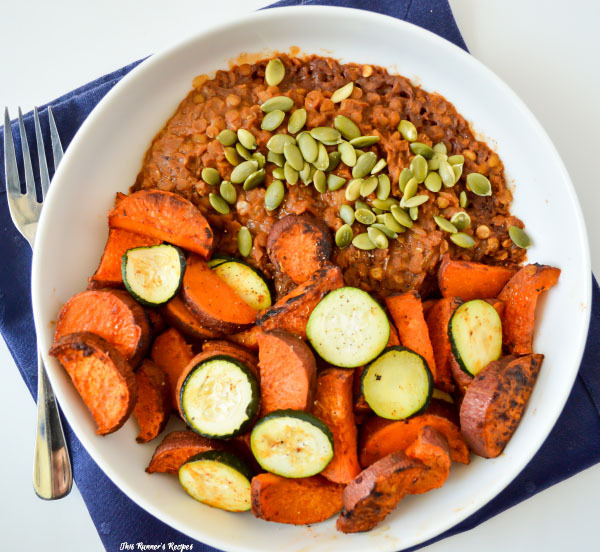 Combine the sweet potatoes, zucchini and lentils and sprinkle with pumpkin seeds. Serve immediately or store in the fridge until ready to reheat and eat. This recipe serves one, but can easily be adjust for 2-6 servings. If I’m extra hungry, I’ll add half of a small avocado, a lemon tahini sauce, and/or eat a slice of bread on the side. Because even though I’m only using the elliptical this week (thanks, foot), I still have the appetite I normally have while running. What’s your current favorite lunch? Share some of your other current favorites: gear, TV shows, snacks, beers, etc! What are your weekend plans? We’re going to the ocean! We’ve lived here for a year now, so it’s about time we see some of the Pacific. Laura, this looks like my kind of lunch. This weekend I have yoga teacher training Fri-Sun, Chad is running an ultra and my daughter is doing Relay for Life. Busy. And all wonderful. Your weekend sounds wonderful Jill – full of so many exciting opportunities! Good luck to all of you this weekend! you know I like the looks of this since it’s so much like what I eat every day! I have to make a batch of lentils this weekend for next week. I like to cook a few servings at once. I hate lunch but lunches like this can really be so satisfying and make me like the midday meal a bit more! We eat such similar lunches! You really can’t go wrong with the combo. I love how easy it is to batch cook lentils and got the idea from you I think. Now I make a bunch for Ryan and I to have for lunch throughout the week, makes lunch so much easier. My favorite recipes aren’t recipes. They are the ones just like this – take whatever you have and serve in a bowl. Healthy doesn’t have to be complicated! Enjoy the ocean…I’ll be waving from the Atlantic! Do you know that I have never cooked lentils before? I actually don’t even think I have ever eaten them. So while this sounds easy in theory, for me it sounds overwhelming because it involves something so new and different:) I love the idea of this kind of make ahead lunch. Usually my lunches are some kind of combination f leftover or salads. They’re super easy to make! I even just bring them down to a simmer and leave them be while I work/clean/cook other things, as long as you have a time set they’re hard to mess up (which is probably why I like them so much, ha). Leftovers are great for lunch as well! One of these days, you are going to find a way to get me over my issues with lentils. That is your mission, if you choose to accept it. I choose to accept that mission. It took me years to get over my issues with lentils and then once I tried them they went right up there with chicken and eggs in being favorite protein! that does look really good! i’m hoping for nice weather this weekend as it rained so much during the week! Thank you! Hopefully you do get some nice weather – rainy days for over a week can just get frustrating! Looks soooo delish and healthy! Best of both world! Thank you! 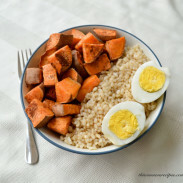 These sweet potato based bowls always look so colorful and hearty! They do! I love the bright orange colors! I didn’t know sweet potatoes had potassium. Good to know! Enjoy the ocean. Get into those healing waters and get your foot/calf better! Okay, maybe it’s too cold for that. Anti-inflammatory? Ha ha. Both sweet and russets have a lot of potassium! I think that’s why they work so well even for runners who eat potatoes as a pre-run snack or mid-run fuel. Ha ha yes, cold therapy is a thing, isn’t it? I should try that – Ryan tried to get me to soak my feet in the cold alpine river after our hike, but I was silly and worried about slipping on the rocks. This sounds amazing and I’m a huge fan of smoked paprika! One of my favorite spices, next to cumin. My foot is feeling so much better–almost 100%–so I’m planning on doing my 8 miles tomorrow, even though it will likely be rainy. A current fave of mine is testing out different IPA craft beers! Cumin is another good one! I’m so glad your foot is feeling better. And I LOVE IPA beers! Have you tried the Sam Adams Rebel IPA? It’s so good! Which ones have you liked so far? Ah, this looks all kinds of amazing! <3 I love sweet potatoes! This looks so simple and delicious. I have a hard time planning lunch. Between working and making dinner, preparing one more meal seems so time consuming. Lunch can be too time consuming! Much better when you can prep early in the week or have leftovers. And thank you!